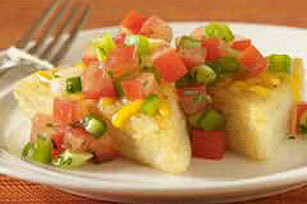 Crispy cheese-topped polenta triangles made with hot wheat cereal are topped with a zesty salsa. Serve as a side dish alongside grilled meats or fish. Bring water to boil in large saucepan. Stir in garlic. Gradually add cereal; cook 1 to 3 minutes or until thickened, stirring constantly. Remove from heat. Spread into greased 8-inch square pan; cover. Heat 2 tsp. of the oil in large nonstick skillet. Add 8 of the polenta triangles; cook 2 to 3 minutes on each side or until crisp and golden brown on both sides. Remove from skillet; cover to keep warm. Repeat with remaining 2 tsp. oil and polenta triangles. Sprinkle with cheese; let stand until melted. Meanwhile, mix remaining ingredients. Serve over polenta. Substitute chopped fresh parsley for cilantro.